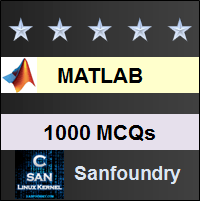 This set of MATLAB Multiple Choice Questions & Answers (MCQs) focuses on “Fourier Analysis and Filtering – 1”. Explanation: Butterworth filters are made using the IIR Filter Design technique while Low Pass Filters are made using the FIR Design technique. Now, Butterworth low pass filters can be made using the IIR Design Technique. But the kind of low pass filters. a) Returns a 3-point D.T.F.T. b) Returns a N-point D.T.F.T. c) Returns a 3-point D.F.T. Explanation: There is no function called dtft. The command is fft which uses the fast Fourier Transform Algorithm and get the 3 point D.F.T. of the above matrix. b) Yield a 2-point D.F.T. Explanation: The process of the fft() command includes the operations mentioned. The syntax, in this case, is wrong since the input vector is given in parentheses. The input vector has to be placed within . Explanation: The fir1() command is a pre-defined command in MATLAB and it uses the Hamming Window method to obtain the Response of any FIR filter. Low Pass Filters FIR method would’ve been correct but FIR filters using Window Method is a more generalized answer. Explanation: The fourier transform can be used to find the multiplication of two signals in time domain. The convolution of two signals in frequency domain is same as the multiplication of two signals in time domain. Explanation: The rectangular window function is multiplied with the incoming signal so that the unrequired components can be filtered out from the signal. This is the basic principle of filtering. Explanation: The result of i is a 2 point DFT of the input vector but it treats the input vector as a matrix and returns the DFT of the elements of the matrix row-wise. Hence, there is only one row which is the vector itself. Hence, the results of both codes will be same. Explanation: The butter command is used to generate the filter co-efficient of a Butterworth filter. This is done by giving the order of the filter and the cut-off frequency as input to the butter filter. The ripple frequency and the stopband attenuation is given to the buttord() function. Explanation: Unless mentioned, the default type of blackmann window generated by the blackmann() command is a symmetric one. It is an N-point symmetric blackmann window and hence the rest of the options are incorrect. Explanation: There is syntactical error in this code. The input to the hamming command has to be within a pair of parentheses. Hence, the above code will give an error. Explanation: fft2 will return a 2-D D.F.T. of the vector given as an input to the command. It won’t give a 2-d matrix but a vector only. 12. What is the function of the unwarp command? Explanation: The functioning of the unwrap command is based on the tolerance limit, ‘pi’, which is used to multiply the input vector with 2*pi so that it can return values for a smoother phase plot. Hence, Generate smoother phase plots is correct. Explanation: The default tolerance value for which the unwarp function changes the elements of the input vector is pi. It can be changed by mentioning the tolerance value separately in the command. Explanation: The hamming code returns the L point hamming window as a column vector. Hence, column vector is correct. 15. What is the value of N while creating a 27 point Hamming window? Explanation: An L-point window is created with L=N+1. Hence, for a 27 point window, the value of N is 26. The rest of the options are incorrect.